Some people have a sweet tooth. Some people have a salty snack hankering. I love creamy. And it's still totally wintertime in Portland, so comfort food is still very high on the priority list. Risotto fit the bill. Creamy, earthy, rich and delicious. Mushrooms and pancetta make this meal just perfect! We had this for a Sunday night, special dinner. 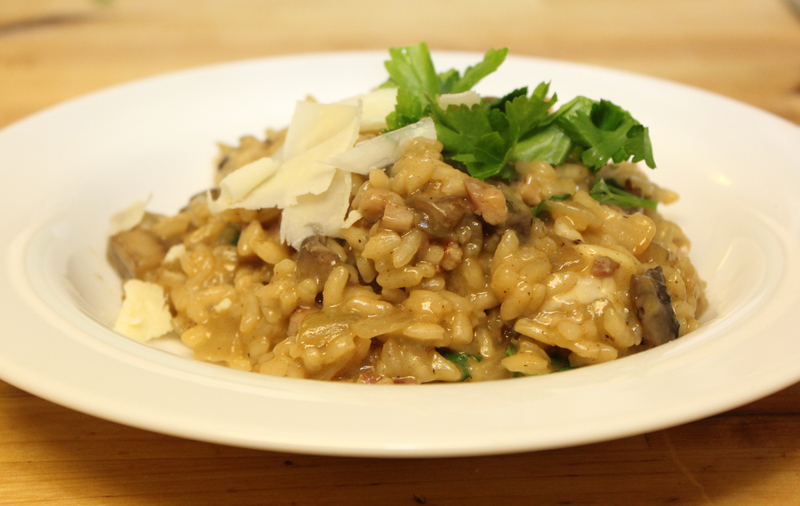 Risotto isn't hard, but it is a commitment. You have to stir and you have to keep watch. It takes about 35 minutes start to finish, so the timing isn't too bad and the end results are totally worth the commitment. In a high-sided pan and in 1 tablespoon of butter, fry the pancetta, mushrooms and onions, about 7 minutes. Once the mushrooms and onions are soft and the pancetta is browned, season with salt and pepper and transfer to an oven-proof dish. Keep the mushrooms and onions warm in the oven while you make the risotto. In the same pan, add the second tablespoon of butter to the pan. Toast the Arborio rice for a few minutes over medium-high heat. In a second pan, heat the chicken broth - keep it hot, but not boiling. You'll need to add hot broth to the rice, not cold broth. De-glaze the pan with the wine, stirring to pick up all of the browned bits of pancetta, mushrooms and onions. Keep stirring while the wine is absorbed. 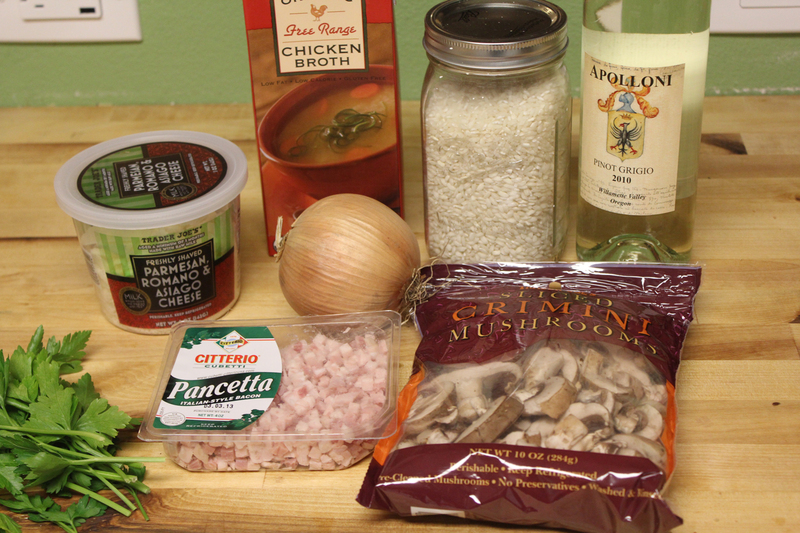 Once the wine is all absorbed, add chicken broth to the rice about 1/4 cup at a time stirring until it's absorbed each time. Summon patience and keep adding the liquid just a bit at a time. And keep stirring. You may not need all of the broth, or you may need a bit more. Test the rice for done-ness like you would test pasta - it should have a bit of bite in the center, but shouldn't be crunchy. Once the rice is cooked, stir back in the mushrooms, pancetta and onions. Add in the cheese and the flat leaf parsley. Stir until combined. Season with more salt and pepper to taste. Garnish with a bit more cheese. A bit more cheese is always nice. This has a full wine flavor. If you like less wine flavor, use more chicken broth to come up with the same amount of liquid. A mushroom blend would be nice. This would be a great Valentine's Day dinner!